El Al Airline Johannesburg Bookings qualify to earn exclusive SouthAfrica.TO travel vouchers - merely email a writeup of your flight to cheapflights@southafrica.to and we'll send you flight discount vouchers. Having been targeted for hijackings several times, El Al (IATA: LY, ICAO: ELY) is considered to have have the most stringent security measures of all airlines. Its obsessive attention to security, use of armed air marshals on every flight and longer check-in times than other airlines has meant that it has only had a plane hijacked once, in 1968. It has also never had a passenger carrier crashing. The airline operates direct flights from Johannesburg to Tel Aviv (JNB-TLV). On the down side, El Al has a terrible record when it comes to travelling on time. The official name under which it trades on the Tel Aviv Stock Exchange is "El Al Israel Airlines Limited". You cannot fly with El Al Israel Airlines on religious holidays or the Jewish Sabath, and you're going to eat kosher in-flight meals. Use the flight price comparison tool on the left to identify & make the cheapest flight booking. 23 March 2018: El Al are increasing their flights between Johannesburg and Tel Aviv to five times per week from the 29th of October 2018. Flights will depart Johannesburg on Mondays, Tuesdays, Wednesdays, Thursdays and Sundays. Return flights from Tel Aviv will depart on Mondays, Saturdays, Sundays, Wednesdays and Thursdays. 19 December 2013 : Turkey & Israel agree to improve security at Turkish airport to enable Israel's civilian airlines to fly there. Currently of the 112 weekly flights from Tel Aviv to Turkey, none are flown by an Israeli airline. Most flights between the countries are flown by Turkish Airlines. 14 November 2013 : Israel's Supreme Court rules that El Al is is allowed to refuse to carry monkeys on its planes for experimental purposes. 26 June 2013 : Egypt has said that if Israeli commercial planes are equiped with offensive missile systems they wont be allowed to fly to Egypt : "This ban is not confined to Israeli aircraft but applies to all international airlines. Aircraft equipped with offensive missile capabilities will not be allowed to land in Egypt or enter Egyptian airspace." Egypt is apparently referring to the C-MUSIC system, but confusingly that uses a lazer-beam, and not missiles. 1 July 2013 : El Al changes its fuel surcharge from Rand based to US dollar based ($590 for return flights, $295 1-way), as a result of Rand depreciation. 19 June 2013 : El Al Airlines installs & tests C-Music, a new anti-missile system, which provides DIRCM (directional infrared countermeasures). The system was installed on a B737-800, and is hoped to protect against surface to air missiles. The C-Music system direct a laser beam at the missile to divert it. May 1988 : El Al sets a world record, flying 12000km from TLV to LAX in a B767-200ER. In October 2013 El Al Israel Airlines receives its first of 6 B737-900ERs it has ordered. The second arrives in December and there are 4 more which come in 2016. The 16 business class passengers will enjoy "Millenium Seats" and the 156 economy class passengers "Pinnacle seats". Seats have USB connections near them and electrical outlets(even economy class). 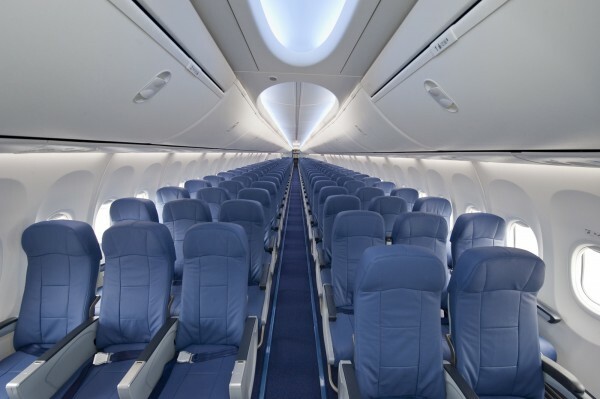 The 737-900ER claims a 5% lower costs per seat-mile over competing models. The plane's maximum rane is 5,990km with auxillary tanks. On select B747-400s and B777s El Al offers power outlets, which are situated at the base between the seats in economy class and below the reading lamp in first and business class. El Al flights from Johannesburg (JNB) to Tel Aviv (TLV) are anticipated to take 9 hours and 15 minutes. Flight LY52 is scheduled to take off from JNB at 20h05 and land in Tel Aviv at 05h20 on Mondays, Thursdays and Saturdays.